The clocks have finally moved forward (hurrah!) and British Summer Time has officially started—but is your house ready for the summer? We all know how important it is to prepare our homes for the harsh winter months, with the brutal toll the cold weather can take on our gardens, pipes, gutters and drains, but in equal measures, the endless long hot summer days (dare we say it!) can take its toll on your home and garden too. Taking time to complete maintenance on your home now will prepare it for the months ahead and prevent damage that can occur in the hot weather. At NuVuw we are all about helping you create and maintain beautiful homes and gardens. That’s why we have put together this simple checklist of items to help get your home summer ready. As well as giving your home a polished look, paint also has protective qualities. It protects wood from water and other natural elements, so paint that is peeling or chipping will leave wood vulnerable to things like mould and rot. Keep on top of the little touch up repair jobs now, and it could save you thousands in repairs for bigger issues further down the line. Just like us, pests and bugs (many who have been hibernating in winter) start to get on the move in the spring and summer months. Sadly for us, they don’t always just stay outside. 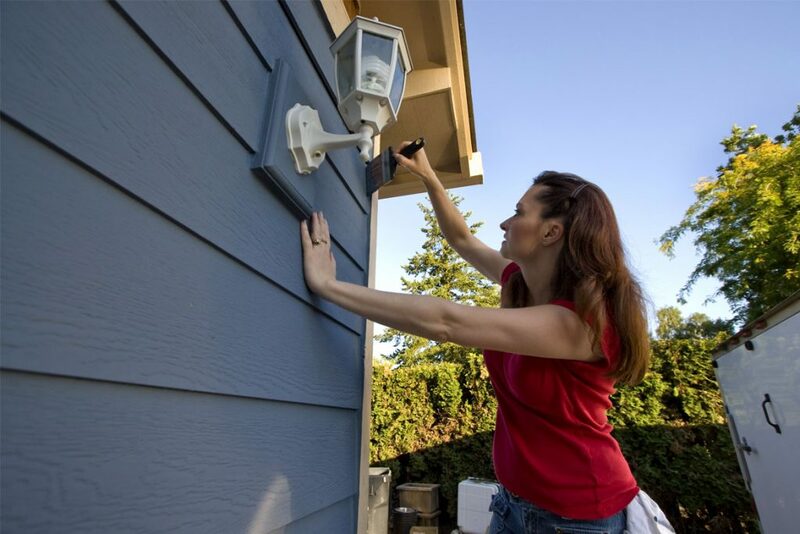 To help prevent bugs and other pests from entering your house, check it is all properly sealed. Through the winter months, door stripping can become cracked and worn. Replace this and check the caulking around your windows and doors, both inside and out. Finally, take extra measures by spraying the outside of your house around the windows, doors and foundation with a preventative insecticide. You could also spray around entry points and the corners of the inside of your house too, with a suitable spray. Check that you are not going to be caught out when the April showers hit, by ensuring that your gutters are clear of leaves and dirt that has built up in the winter. Check that there are no cracks or breaks, and check the downspouts. You need to ensure water is directed away from your house by three feet or more. Also replace any caulking that is showing signs of wear or cracking. Finally, inspect your roof to ensure it’s in good working order (remove any debris and leaves while you’re up there). You can call a professional who can arrange a quick inspection if you are not comfortable assessing this yourself. It’s a good idea to also check your indoor ceiling for early signs of leaking. If you notice dark water stains or paint peeling, get this sorted and quickly. Call in a professional to get any leaks repaired before the summer rain storms really hit. If you have any trees or shrubs that are close to the house, be sure to give them a trim. Damage from trees and shrubs rubbing against your property can cause serious damage that can be very costly to put right. Your deck or patio becomes another “room” during the summer months as you de-camp to the garden for long lazy afternoons. 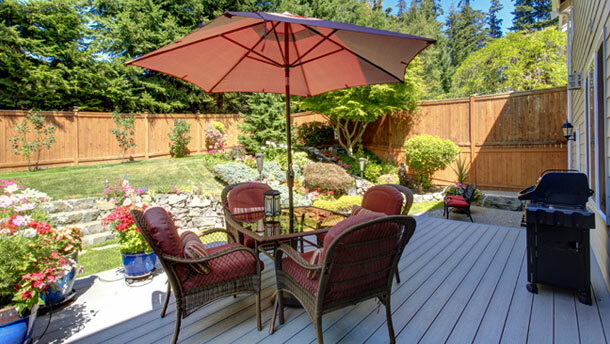 As with any wood on your house (or indeed fences) protecting the wood on your deck from sun and water is essential. Clean your deck by removing dirt with a power washer or good old-fashioned soapy water and a scrubbing brush. Then, seal the decking with an outdoor wood stain, paint or a sealant to ensure its longevity. With the right care and attention, your deck can last a lifetime. For a patio, a good clean with soapy water, a scrubbing brush and hose (or power washer if you have one) will give your patio a new lease of life. After cleaning and arranging your furniture, create a relaxing space using outdoor lights, candles, pillows and flowering planters. This is the time of year when most of us start our internal DIY projects to update the look of one or several of our rooms. 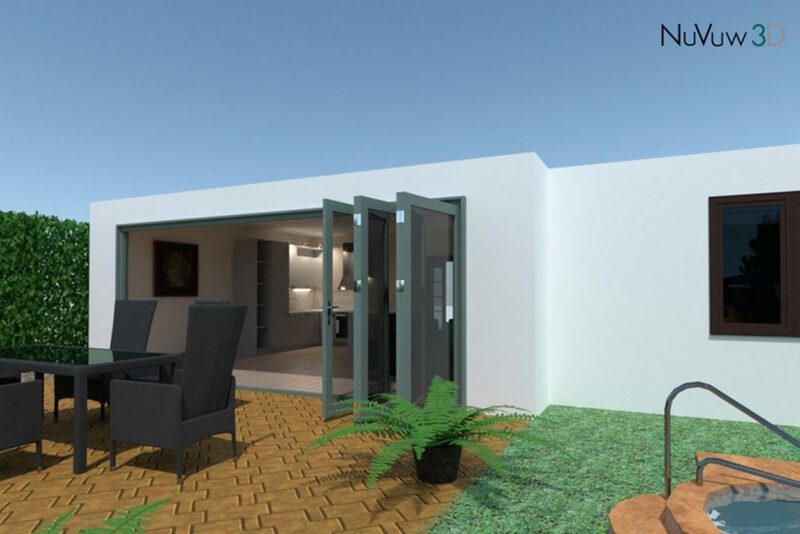 The design tools in NuVuw allow you to model the layout of your rooms within your property, but also really visualise the end result by adding carpets and flooring, accessorising your rooms and painting your walls. Imagine the money and time that you will save on tester paint pots and trips to the local DIY store! With a few simple clicks, you can choose every shade of colour imaginable to change the view of your rooms. You can then convert your 2D model into 3D, and take a virtual tour through the rooms, so that you can get a sense of what it will all look and feel like. Try it—it’s really realistic! Useful tip: Did you know your ceiling fan is designed to rotate differently depending on the season? In winter months, it should rotate clockwise to help distribute heat that’s risen. In the summer though, you should run your fan counter-clockwise at higher speeds to get a breeze going. You can also make some very simple interior updates to make your home feel ready for the summer, like bringing in lighter and brighter accessories, removing anything that makes you think of winter (such as big heavy throws, thick winter rugs and logs for the fire), and add fresh flowers and summer scented air freshers to your rooms. You would be amazed at how sparkling windows can really change the feeling of a room too. Give your windows inside and out a thorough clean, and tie back any thick and heavy curtains to let in the light and brighten up your rooms. Summer is a season for getting out there, having fun and relaxing. Take the time now to attend to a few maintenance tasks, and save money and stress in the years ahead. How can NuVuw help you? Whether you are a property developer, homeowner or landlord, NuVuw can help you manage and keep track of property development, renovation, and maintenance projects. The platform has all the tools you need for end-to-end property development and management covering design, project management and collaboration with professionals. Find out more by visiting <www.nuvuw.com>. It’s free to sign up, so take a look today and get your next (or first) project set up.